Gargamel! 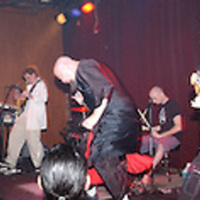 performing live at The Social, located at 54 North Orange Avenue in Downtown Orlando, Florida, on July 31, 2003. The first photograph features, from left to right, Wayne Larsen on keyboards, Ryan Dailey on guitar, Chuck Ellis on vocals, John Webber on drums, and Lester Stover on bass. The second photograph features Ellis. Gargamel! was formed in 1992 in Orlando, consisting of Chuck "Mandaddy" Ellis on vocals, John "Webb" Webber on drums, Matt "Boy Howdy" Lapham on bass, Darin "Skyjak" Bridges on guitar, and Pat “Headless Spawn” McCurdy on guitar. 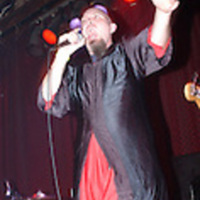 In 1995, Lester “Crazy Hector” Stover replaced Lapham on bass, and Wayne “Servo Beonic Man” Larsen joined on keyboards. Ray "El Diablo Guapo" Rivera joined on guitar in 1996, and was replaced by Ryan "Professor Knuckles" Dailey in 2000. Webber was replaced by Andy Mas on drums in 2006, and Mas was replaced by Kevin "Heavie Kevie" Collado in 2011. The band is rooted in funk metal, but their music combines elements of experimental rock, jazz, funk, Latin, ska, hip hop, and reggae. Known for their offbeat sense of humor and the stage antics of lead singer, Mandaddy, who named the band after a character from the animated children’s television show, The Smurfs, and who wears a black and orange outfit modeled after the cartoon villain, the band often incorporates surprising covers, such as Billy Joel songs. They have shared the stage with such national artists such as GWAR, Anthrax, Dog Fashion Disco, Tub Ring, Sleepytime Gorilla Museum, Genitorturers, Mushroomhead, Nonpoint, Bad Acid Trip, Skindred, and Skeleton Key. Original color photographs by Alicia Lyman, July 31, 2003: Archive: Concerts Archive, Alicia Lyman. Digital reproduction of original color photographs by Alicia Lyman, July 31, 2003. http://alicialyman.photoshelter.com/gallery-image/2003-07-31-GARGAMEL-The-Social-Orlando-FL-2003-07-31-GARGAMEL-The-Social-Orlando-FL/G0000z.9C1sWJS7g/I0000WtEqyopMBe4/C0000UMZoXUUZnpc. Padgett, Mark. “Gargamel! Unmasked.” Orlando Weekly, June 14, 2000. http://www.orlandoweekly.com/orlando/gargamel-unmasked/Content?oid=2259127. Jordan, Douglas. “Gargamel! is in your face.” Gainesville.com, January 24, 2003. http://www.gainesville.com/article/20030124/COLUMNS10/201240309. Lyman, Alicia. “Gargamel! at The Social, 2003.” RICHES of Central Florida accessed April 25, 2019, https://richesmi.cah.ucf.edu/omeka/items/show/5332.